Viewpoint 44: A Marshall Plan? Context: The donor’s conference in Tokyo concluded on April 17 with a 5.28 Billion US $ pledge in economic assistance to Pakistan. A number of references have been made to this forthcoming package of assistance as being analogous to the Marshall Plan. This comment explains why comparable impact is unlikely for a number of reasons. The donor’s conference in Tokyo and the meeting convened by the Friends of Democratic Pakistan on its sidelines concluded on April 17 with a 5.28 Billion US$ pledge in economic assistance to Pakistan, congressional approvals permitting. A number of references have been made to this forthcoming package of assistance as being analogous to the post Second World War Marshall Plan, particularly in Pakistan, with the expectation that the outcomes will be likewise. It is important to understand that comparable impact is unlikely for a number of reasons. First, the Marshall Plan was planned and implemented at a time when the United States had emerged as one of the greatest powers in the aftermath of the Second World War. At that time, the United States was affluent enough to play a key role in assisting with the rebuilding and reconstruction of Western Europe. The situation today is not comparable, as a result of the constraints imposed by the global financial crisis. Secondly, the Cold War notwithstanding, Marshall aid was delivered in a post war era, in an environment where the huge job of reconstruction was to be executed; states in Western Europe thought that the best way of doing this was through a joint effort; in fact many moves towards unity took place during this time. Pakistan is still ravaged by conflict and many divides; even within this one country, the political and geo-strategic backdrop poses a number of impediments to the effective deployment of development assistance. Thirdly, and most importantly, Marshall aid also had a sound macroeconomic rationale; aid was targeted in an environment where there was an increase in world demand for European products and where rapid technological advances were taking place. These factors coupled with assistance, which focused on rebuilding the industrial and agricultural base, helped Western European states to recover surprisingly quickly from the effects of the war. Today the global financial crisis and Pakistan’s own macroeconomic situation present a very different international and domestic context. In the fourth place, and relevant to assistance in the space of the social sectors, it is important to recognize that Marshall aid was channeled against the backdrop of careful planning by several governments and in an environment of governance where systems and structures functioned and where legislative frameworks had already been created. The end of the Second World War had accelerated the demand for social change. In Britain for example, the Beveridge Report of 1942 had already provided a massive plan for welfare while the Butler (Education) Act of 1944 and the Family Welfare Allowance Act of 1945 had already been enacted. Governments and people in most of the Western European countries had shown a clear indication to move away from the pre-war complacency, which accepted squalor and high levels of unemployment as inevitable. The situation in Pakistan is not comparable in any way. High levels of poverty and lack of education are prevalent; the societal political culture—the lawyer’s movement notwithstanding—remains weak and consolidated frameworks to make equity and social justice a centre piece of public policy are yet to be developed, despite pronouncements in political party manifestos. In addition many structures that are necessary for aid to be effective suffer from weaknesses—it is well established that aid functions best in environments where structures, systems and frameworks are in place. In the fifth place, Marshall Plan was implemented in an environment where the global normative and governance systems and a new global economic order were being concomitantly established. Conversely, today, the world is undergoing a profound transformation where a number of economic and political crises highlight the need for change in global systems, institutions and processes. Lastly, size of the envelope must also be brought to bear. The level of committed assistance is far from adequate, as has also been publicly acknowledged by Ambassador Holbrooke. The government of Pakistan and the development partners must therefore step back and develop a set of pragmatic expectations for the level of assistance envisaged to be in the pipeline, particularly within the remit of development. There are a set of measures that the development partners should undertake and another dimension of imperatives the government should seriously consider. While doing so, it is important to bear in mind that aid is not the answer to our issues; that the problem lies at the level of laws, regulations, practices, mindsets and overall state functioning and that it will take political resolve and astute technical ability to overcome these constraints. Despite these limitations, aid has the potential to impact policies, governance structures and instruments in Pakistan, not by virtue of its size but because of limited capacity within the state system, which inadvertently makes room for policies to be donor driven and because of the conditionalities it can stipulate as a pre-condition for funding. This potential to catalyze change can be positively harnessed. Development assistance in Pakistan has traditionally been allocated on the premise that it should be able to achieve the largest possible reduction in poverty. However, it must be recognized that these endpoints cannot be achieved without effective governance. Therefore, a core priority area for allocation of development monies should be to further accountability and transparency in government systems and bridge the key governance shortfalls through sectoral reform. Such choices can have a more lasting and sustainable impact compared to development assistance that sets up projects in ideal donor-resourced conditions, which subsequently cannot be up scaled because the core limitations in the functioning environment remain unchanged. In Africa much of the recent discussion on increasing development assistance has been in the context of a ‘compact’ particularly in the health sector within the rubric of the International Health Partnership, where aid from donors is being matched with increased attention to good governance by recipient countries. Such benchmarks can bring value in environments such as ours as well. Donors must also carefully explore the impact of integrating their foreign policy and development objectives in Pakistan’s complex socio economic environment and learn to benefit from democratic influences such as broad-based consensus driven planning outside conventional channels in shaping strategic priority goals. A stronger emphasis on streamlining Pakistan’s aid architecture, a more focused approach to maximizing synergies between partners and efforts to curb the costs of managing and delivering aid should also be a priority. Additionally, the issue of fungibility of aid, which implies that governments may divert domestic resources to other uses given the presence of donor aid in a sector, and therefore, experience difficulties in reallocating resources to these priority areas, once donor assistance is not available, also deserves close attention. The Government of Pakistan must look at this additional envelope of assistance as an opportunity to systematically strengthen country systems. The importance of a multi-partisan and broad-based stakeholder consensus on the Agenda for Reform has been reiterated in these columns on April 11; concomitantly, donors and the Government of Pakistan must also invest in domestic policy leadership. Without focusing attention on these central systemic issues, which continue to impede the greater impact of development assistance and overall state functioning, not much will be achieved in the long term. It is hoped that in this environment where there are strong geo-strategic and security motivations for much of the aid coming to Pakistan, the rich countries will also review their broader development footprint and in addition to committing traditional bilateral and multilateral assistance will also assist in wiping out external indebtedness and assist with mainstreaming a more conducive framework for trade—both of these factors can have a more sustainable impact on development, welfare and Pakistan’s proactive and peaceful role in a globalized world. 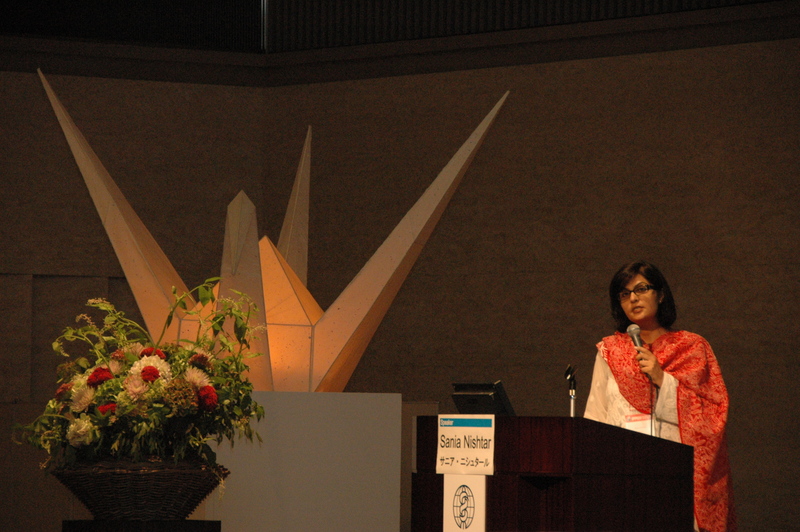 April 24, 2009: Sania Nishtar participates in a meeting of the World Health Organization’s Implementers Consortium on Maximizing Positive Synergies between Health Systems and Global Health Initiatives, held in Chiangmai, Thailand, on April 23-24, 2009. Attends the meeting as a member of WHO’s Maximizing Positive Synergies Group. Context: The White House has recently released a White Paper on US policy to Afghanistan and Pakistan, articulating a number of geo-political and development imperatives for the region. This comment will focus only on the dimension related to development assistance within the contemporary realm of aid effectiveness. The White House has recently released a White Paper on U.S. policy to Afghanistan and Pakistan, articulating a number of geo-political and development imperatives for the region. This comment will focus only on the dimension related to development assistance within the contemporary realm of aid effectiveness. The US policy paper outlines a strategy centered on stepping up economic support to Pakistan; the importance of this has also been reiterated by President Obama’s three-pronged call for increasing development assistance for the country in his speech on March 27, 2009 and is evidenced by support signaled for the bipartisan Kerry-Lugar Bill and the Cantwell-Hollen-Hoekstra Bills and endorsement of support for Pakistan to the ‘Friends of Pakistan’ who are scheduled to meet in Japan later this month. The policy statement has made some bold and honest admissions. For one, it has recognized that aid has remained “Ill-organized and significantly under-resourced in some areas [and that] a large portion of development assistance ends up being spent on international consultants and overhead, and virtually no impact assessments have yet been done on our assistance programs”. Recognition of these constraints can be helpful in working towards the intended impact of bilateral assistance in future. However, the forthcoming increase in assistance raises the question of the extent to which aid can be effective in achieving intended outcomes in an environment where inefficiencies are endemic. Review of development projects in Pakistan raises many concerns about the robustness of processes of the state that are meant to translate funding and other resource inputs into desired endpoints. A historical perspective of global efforts initialized by development agencies to address the issue of aid effectiveness in environments such as ours can help put things in perspective. Over the years, donors have rallied around a number of approaches centered on harmonizing and coordinating aid and pooling aid in support of a particular strategy led by governments; these approaches have partly been aimed at strengthening country systems and in part, aimed at minimizing duplication and high transaction costs of multiple donor inputs. Attempts by multilateral agencies to promote institutionalization of Sector Investment Programs, Sector-wide Approaches and Comprehensive Development Frameworks in developing countries have been part of this approach. Although many of these frameworks have not been adopted in Pakistan, per se, their principles were capitalized in the Social Action Program, which was implemented in Pakistan from 1992-1996 and more recently in the tendency to give aid ‘on-budget’ in alignment with the Medium Term Development Framework and the Poverty Reduction Strategy Paper. Beginning in 2002, the aid effectiveness debate gained momentum with a series of consensus statements—Monterrey Consensus 2002, Rome Declaration 2003 and the Marrakech Memorandum 2004; these culminated in the Paris Declaration on Aid Effectiveness in 2005, a high level commitment to using aid effectively and was followed by the Accra Agenda for Action in 2008 to engage donors and developing countries in a new paradigm of aid as a partnership in order to achieve the MDGs. The principles and corresponding targets of the Paris Declaration, centered on ownership, alignment, harmonization, managing for results and mutual accountability aim to strengthen country systems, capacity and leadership, synergize donor operations and harmonize, align and manage aid for results with a set of monitorable actions and indicators. The U.S White Paper strategy echoes many of these principles, particularly by signaling that assistance will be limited without the achievement of results. The Organization for Economic Cooperation and Development (OECD) has conducted two rounds of monitoring, in 2006 and 2008, to measure the impact of the Paris Principles. For the second round of monitoring, findings reflect information provided by 55 developing countries in relation to USD 45 Billion of aid—nearly one half of all the aid delivered in 2007. Pakistan was not one of the countries surveyed; however, findings of the survey triangulated with existing information have been useful in developing a generic understanding of the impediments to aid effectiveness within developing countries. Conclusions of the OECD survey stated that “in order to change practices in international aid, there is the need to shape deep seated behaviors; these changes in the process of development and the nature of aid relationship require time focused attention and determined political will. It is not easy to change laws, regulations, practices and mindsets……”; in other words, there is a need to focus on the central systemic issues which continue to impede the greater impact of official development assistance. In many ways, the White Paper strategy seems to speak the same language in its call for ‘strengthening capacity of the country’ and admitting that there can be ‘no quick fixes’. There are no disagreements about the need for deep-rooted systemic reform of governance in Pakistan. We all agree that transparency in governance is an imperative for achieving any public policy endpoint and that technocratic reform in the civil service domain and sectoral reform in areas such as public financial management, procurement and audit are critically needed; there is broad-based endorsement of the need to revamp the public management process and mainstream accountability and efficiency in state governance. All of us are passionate about addressing organized vested interest that promotes state capture, strengthening an independent judiciary and fostering civil society oversight, freedom of information, open media and avenues for seeking redress. If archives and documents of the Ministry of Finance and the Economic Affairs Division are analyzed, it becomes apparent that donors have assisted with institutionalizing systemic reform of every conceivable nature in the country. The problem is clearly not with initializing reform, but consolidating initiatives, ensuring effective deployment of pilot projects, sustaining initiatives and taking them to fruition. It has become conventional for one government to initiate ‘reform’ and for the next to de-track or retract completely. There is almost no institutional memory or commitment to consolidate reform initiatives. It is almost a given for those in political roles to prioritize planning based on what is politically expedient and those in administrative roles not to confront them because of the fear of undue accountability; the institutional environment, is therefore, increasingly getting focused on short-term gains as opposed to outcomes and politicization of decision making, patronage, tolerance to circumventing procedures, systemic manipulation and graft has become a norm. The importance of these impediments to systemic reform must be appreciated in aiming for economic stability for the country, welfare for its people and a positive proactive role of Pakistan in a globalized world. The current focus of the world on strengthening democracy in Pakistan is justified, but it must also be appreciated that democracy can only function if popular representation inculcates democratic behaviors of evidence-based decision making and consensus building and democratic values of equality and liberty; this can only be achievable with multi-faceted broad-based reform of the state. A substantive discussion on the where, how, and why of systemic reform can help shape an agenda so that some quick wins in institutional restructuring can be realized. However, this must proceed with a multi-stakeholder ‘sign-up’ to an Agenda for Reform. An inclusive and participatory process should garner consensus of multi-partisan stakeholders, development partners, the establishment and civil society on a technically viable road map for reform and structure multi-stakeholder oversight of the process of its implementation to ensure that reform outlives administrations and is not held hostage to vested interest. This is a critical prerequisite to any substantive discussion on state reform. Pakistan must make effective use of economic assistance in these financially constrained times; however, the objective should be to channel assistance to help strengthen country systems with a view to ultimately transition away from support and to promote debt forgiveness as a tool to free up resources.